As of this writing only a few transients have arrived and even those have been scarce, except for the juncos. With that being said there were two Fox Sparrows, uncommon birds to say the least, in our backyard last week that I had seen only once before and that was in the spring of 1996. Yet, they are common in the Boreal Forest not very far from us. How come, then, we do not see more of them in our yards in the spring along with the rest of the transients? The answer lies in the way in which birds migrate. Birds like Mallard Ducks, Robins and White Throated Sparrows fly a few hundred kilometres and then stop for a few days and get ready for the next short hop. Other birds like the Ruby Throated Hummingbird, many warblers and terns fly very long distances without a break. The Fox Sparrow belongs to the latter group. It does not go that far south in the winter, but once it decides to migrate it takes off and does not stop until it reaches its destination. In other words, it will spend the winter in a place like Kentucky and once it decides to migrate it will fly non-stop from there to the Boreal Forest in Canada over-flying places like Foam Lake. Occasionally, during migration, birds run into very bad weather making flight impossible thus forcing them to land in places where they normally do not. This what happened this year to the Fox Sparrow. I do not wish any harm to the Fox Sparrows but in a way I am glad that the weather turned bad and forced them to land thus providing me with a chance to observe them. 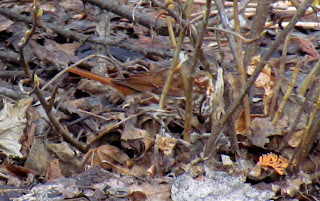 The Fox Sparrow looks much like any sparrow - a brown and whitish streaked bird, except for rusty red upper parts especially the tail. The very noticeable difference is in its behaviour. 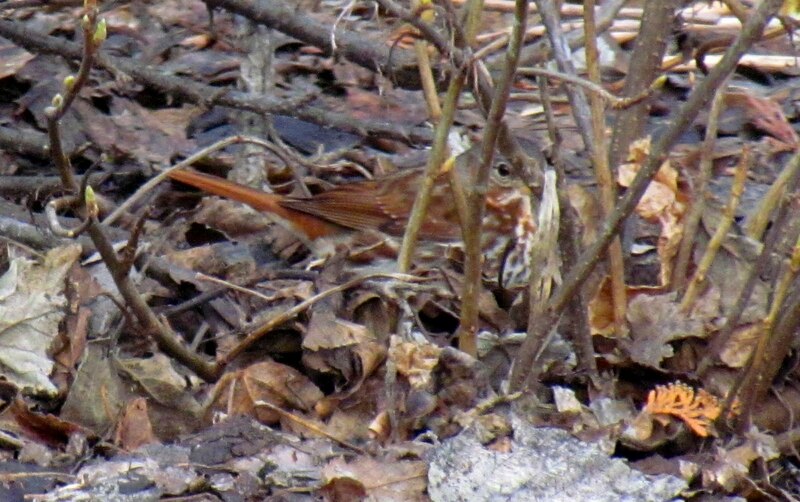 All sparrows like to scratch about in leaf litter but the Fox Sparrow carries it to extremes. Under gooseberry, currant and raspberry bushes it just lets fly with debris being scattered in all directions. It gives the impression that something supernatural is happening until the bird is seen. It then moves over a few inches and repeats the performance. Then, without warning, it will dart across to the next nearest shrub and start all over again. Usually, a birder sees the flying debris first and then the Fox Sparrow. 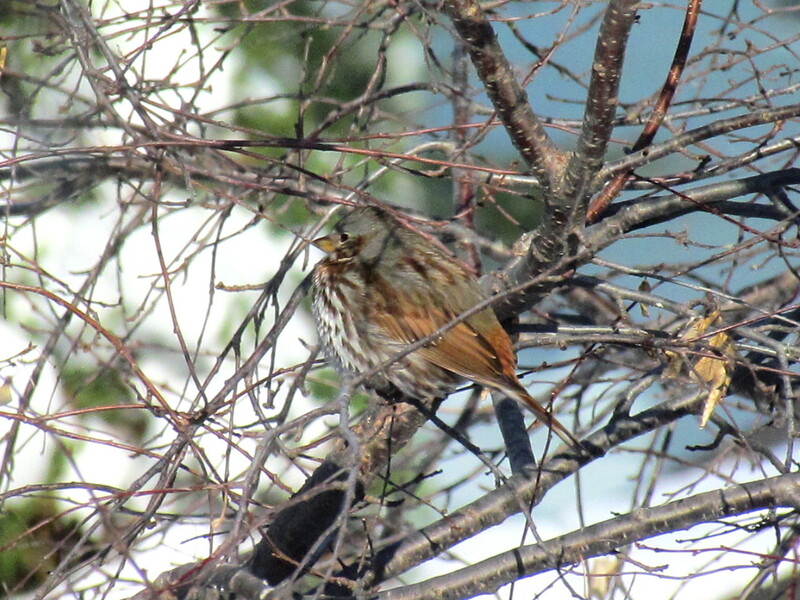 This week's picture was taken two weeks ago of one of the aforementioned Fox Sparrows under our Black Currant bush scratching like the dickens. I wanted to get it into the open where I could get a better shot of it but its quick movements made that impossible. Perhaps if it had stayed around a little longer than the two days that we saw it I might have gotten a better photo but this one will have to do. Unfortunately, it is too late to see them this year but there is always next year. Next year has arrived.